Last week I had the absolute pleasure of joining a handful of other lovely creatives for the first ever Colour Psychology workshop hosted by The Brand Stylist, Fiona Humberstone and The Great Interior Design Challenge's very own Sophie Robinson. Our lovely hosts at Islington's Paper Mill Studios - Fiona, left, and Sophie. Fiona has transferred her knowledge of branding and creating visual identities to interiors and in teaming up with stylist Sophie, together they have developed a foolproof method for answering client briefs quickly and efficiently. As a stylist and designer the psychology of colour has always interested me and it seems that its use in the interior design world is becoming a more and more popular. People are finally starting to realise that it goes much deeper than just surmising that, for example, red is dramatic and neutrals are calming. What Fiona and Sophie explained is that in fact all colours can be used in any scheme (with the exception of black) - it just depends on the tone. Colours can be highly emotive and to create a room that really works for you one must first understand the feeling rather than the look. By using certain key words to describe how a space should feel we can then identify which seasonal personality best fits the room and ultimately create a successful scheme. Spring: fun, youthful and expressive. Summer: graceful, timeless and organised. Autumn: organic, learned and natural. Still with me? Once you have determined the feeling you want your room to convey you can choose the corresponding textures, tones and styles. Here are a few examples of each season, see if you can guess which season is which! Image 1: Winter. Daniel Hopwood (he of The Great Interior Deign Challenge fame) is a typical winter designer. This is evident by his use of bold textures and statement lighting and furniture. Image 2: Summer. The White Company, along with Laura Ashley and designers such as Nina Campbell are typical of this seasonal personality. Think long, lazy lunches, breezy linens and faded grandeur. Image 3: Spring. 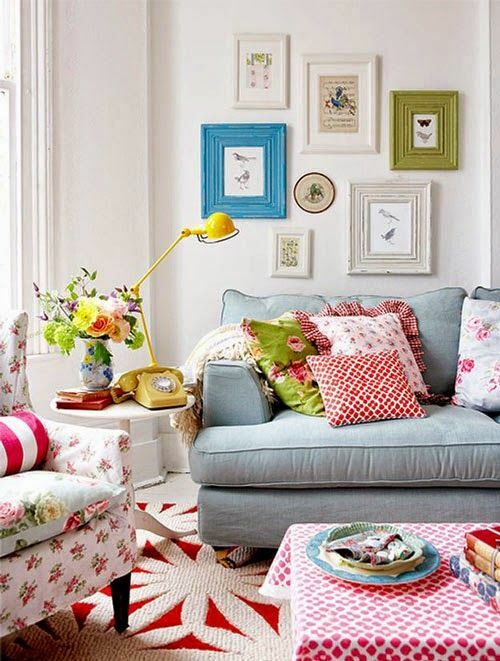 This Cath Kidston style interior is perfect for the spring personality: its fun, bright colour scheme and quirky ditsy prints bring energy and a youthful vibrance to the room. Ikea and Habitat are other retailers which serve this season well. Image 4: Autumn. The interior of designer Oliver Heath's home epitomises the autumn personality. Warm, earthy colours and rustic elements are key: the autumn personality has great respect for the natural world. Other designers who embody this season are Ben Pentreath, Russell Sage and Abigail Ahern. With so many wonderful styles and colours to choose from it's easy to get distracted but applying this method when designing a brand identity or an interior will help to streamline the process and enable you to sort the wheat from the chaff. By sticking to your relevant season you can create a cohesive scheme that best represents you and the message you want to send. Right, I'm off to redesign this website!